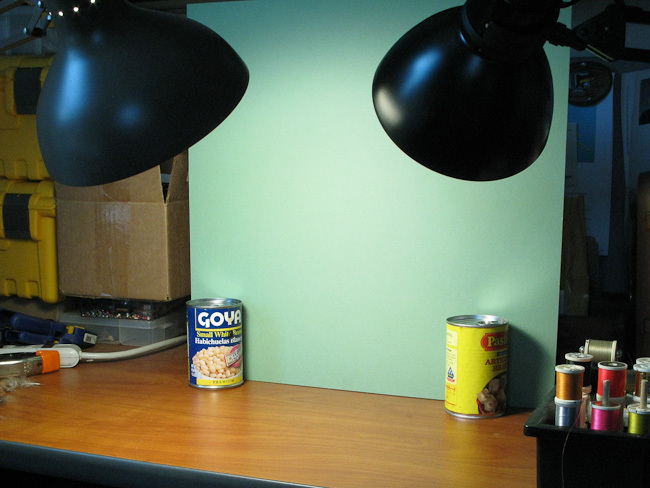 I'm going to describe a simple desktop photo studio. Let's first talk about the background that will be seen behind the fly. If you decide to use a busy background, such as an assortment of colored thread spools stacked on dowels on one of those cool multi-stepped wooden racks, be sure that they are far enough away from the fly to be somewhat blurred in the photo. Otherwise the background will be distracting to the viewer. I've tried busy backgrounds, but prefer a simple approach. 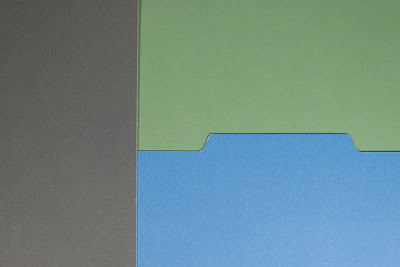 Colored mat board is a good choice if you have access to an art supplier. 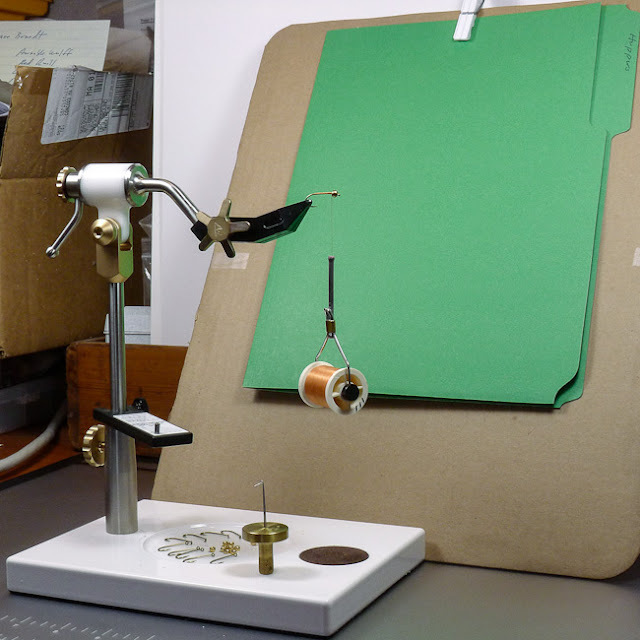 Mat board is the material that is used for mounting photographs for framing. I like to keep the mat board about 8" to 14" inches behind the fly. You'll have to experiment to find what works best for you. A mid-tone background is a good overall choice. I like medium shades of gray, blue, or green. I buy my mat board online, from American Frame. A 12" x 18" piece should be plenty big enough. Colored folders work great too. You can pick up colored folders at Staples or W.B. Mason. Three good colors to use for a background. 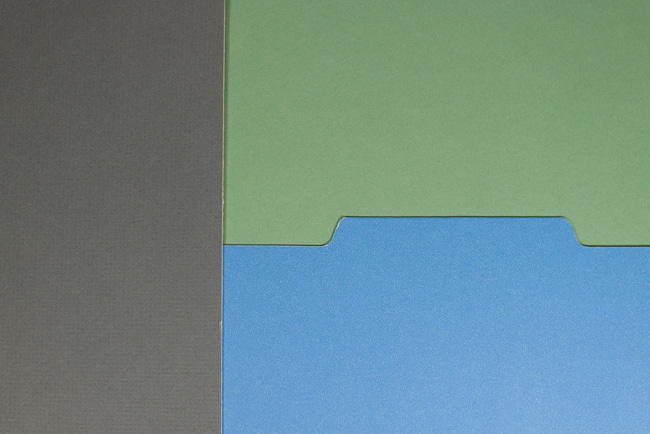 Grey and green are mat board. then it is likely that your monitor needs calibration. Most monitors are too bright and have a blue color cast. In the past, I've propped up the mat board vertically using two 12" lengths of 2x4s, one supporting the mat from the front and one from the back. Here I've used four 16 ounce cans from the kitchen (two at each corner, front and back). Want to simplify one step further? In the picture below, I have merely leaned the mat up at an angle against a pile of stuff at the back of the desk. The pedestal of the vise will hold it in place. The angle of the mat actually reduces the reflection on the camera lens from my tying lights. Plus, it's a great way to hide crap on your tying desk! 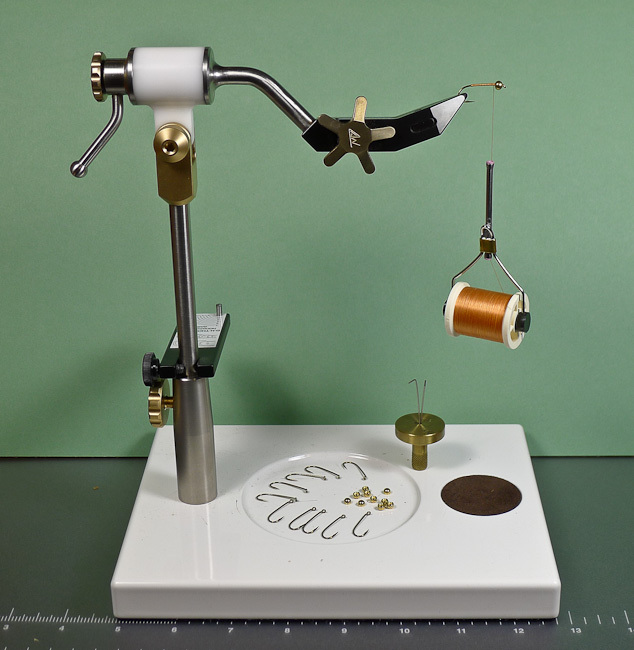 Use this system even when you are not planning to photograph your tying steps. I find the green to be very soothing on the eyes while tying. Don't want to buy any mat board? With a one or two clothes pins, clip a colored folder to a piece of corregated cardboard cut from the side of a cardboard box. All the hopper photos on my Web site were done with this green folder as the background. For light I like two desk lamps with elbow joints. They are held to the table with C-clamps. You can see the lamp shades in the upper two corners of two of the images above. You can buy them cheaply at Staples. I use this arrangement because it is the same lighting I prefer for tying flies. If I could find higher quality desk lights than these $25 ones, I would buy them. But I have to admit, I haven't looked too hard. The ones I have don't hold their positions very well, because I can't get the elbow joints tight enough. I sometimes use duct tape to keep the elbows from slipping. 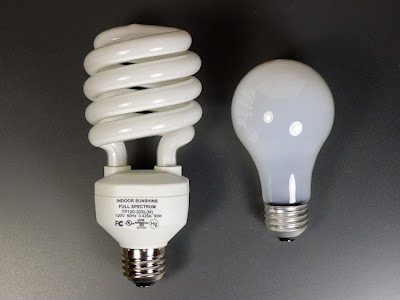 For light bulbs, I use spiral fluorescent bulbs. They are 30 watts. The fluorescent bulbs are nice because they don't heat up. If you use incandescent bulbs, use 100 watts. 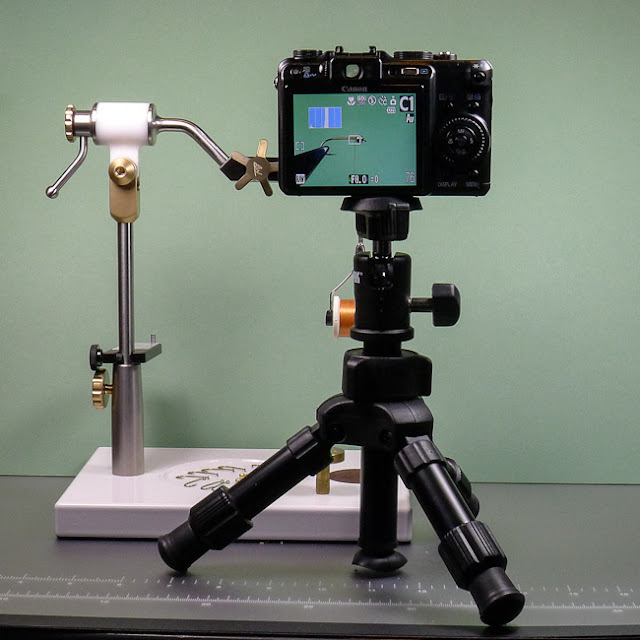 A tripod is needed to free up your hands to hold materials. 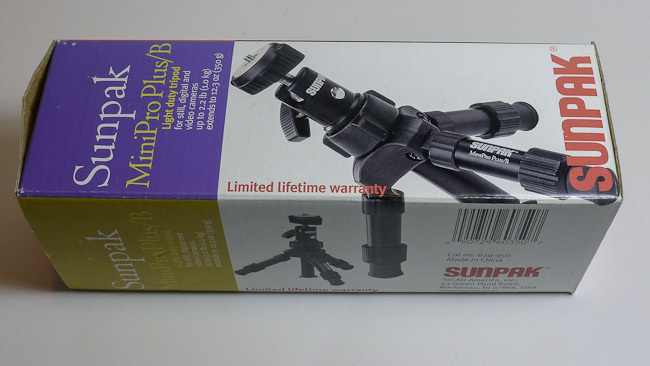 The one pictured below is made by Sunpak and is the MiniPro Plus/B. I think the "B" must stand for "ball head", which easily allows you to move the camera around the ball joint for making adjustments. As of this date (March, 2012) it is selling at Amazon for $20.95. impossible to get light onto the subject. Take a few moment to do a better job than I did lining up the camera and the fly. Available on Amazon for about $21 (as of March, 2012). 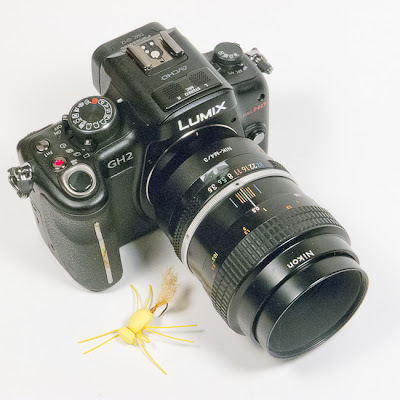 Just about any digital camera will work just fine for photographing flies. 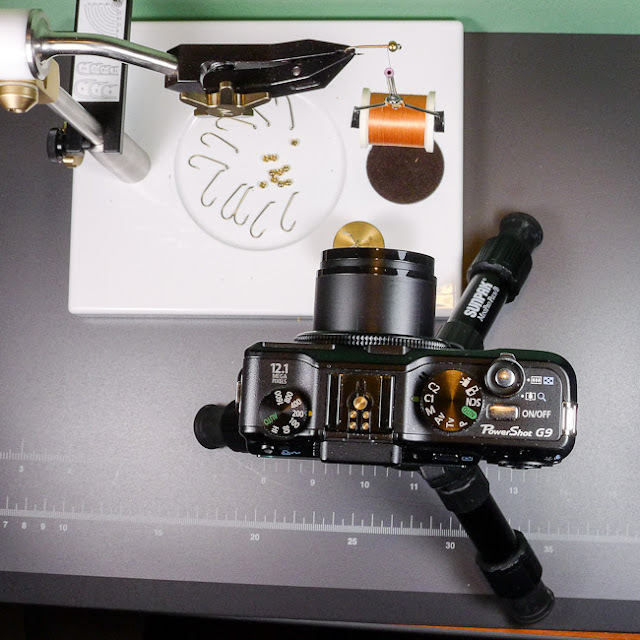 To get the most out of a camera it is best to (1) use the macro feature, (2) turn the flash off, and (3) use a custom WB adjustment. Every camera I've seen has these features, though sometimes the adjustments are deep into the menus. I will explain how I use these settings in a followup blog post. If you are in the market for a new camera, try to find one that is 12-18 months into its production cycle. At that point in time the price is often discounted by 30-40%. I think the best places to shop on the Internet for cameras are: Amazon, Adorama, and BHphotovideo. For an overall useful every-day point and shoot camera for an outdoor enthusiast, I am a fan of the current line of "tough" cameras. 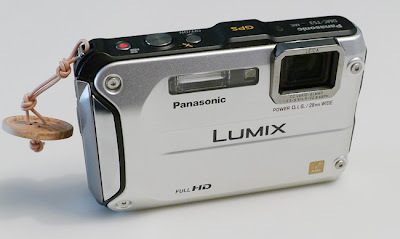 I own the Panasonic TS3. This is now a generation old, having been announced in January, 2011. This meets the 12-18 month parameter described in the above paragraph. My son just bought one at Amazon for $220. Now, each of my three children has one. When they came out they were selling for $350. Being weatherproof, I can take this camera fishing (it will take pictures underwater, too) and skiing (it will operate nicely down to 14F). It is also dustproof and shockproof. 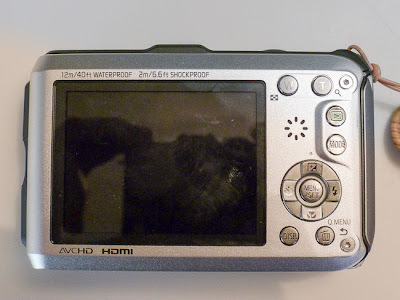 It takes videos clips and has a nice zoom range. It has a GPS for tagging your pictures, an altimeter, a compass, and a barometer. Oh, and it has a macro mode and customizable white balance, both of which are needed for good fishing fly photos. 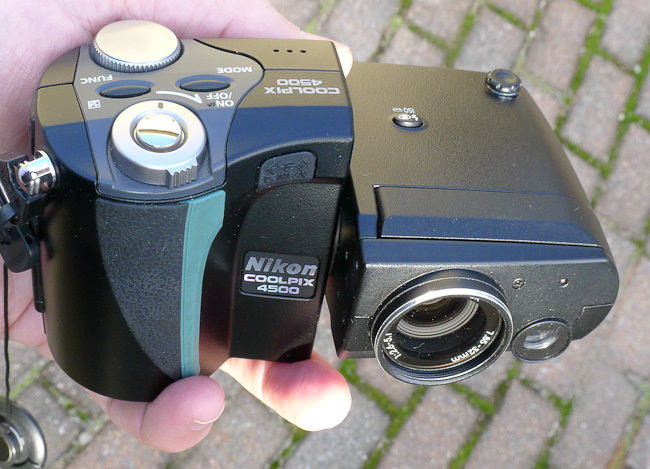 A couple of years ago I sold off my beloved Nikon Coolpix 4500's on Amazon, while it still had reasonable value. I bought the 4500 in 2002 just before this series of split-body cameras was discontinued, and used it for about 7 years. I remember being excited about the $250 rebate that brought the price down to $750. 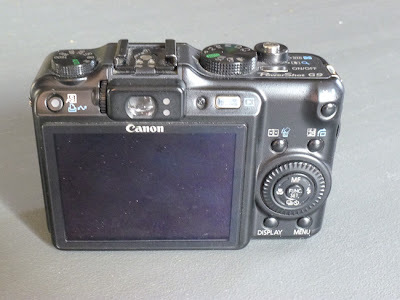 Today, in 2012, $750 can buy a whole lot more camera than it did back then. 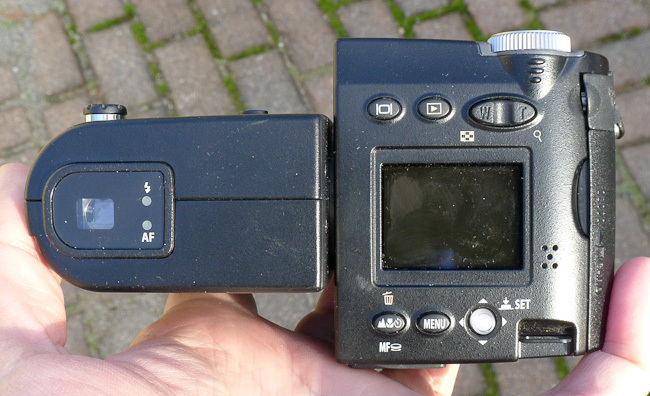 In fact, if you want to purchase a used sample of this Nikon classic, I see them on Ebay often at under $100. 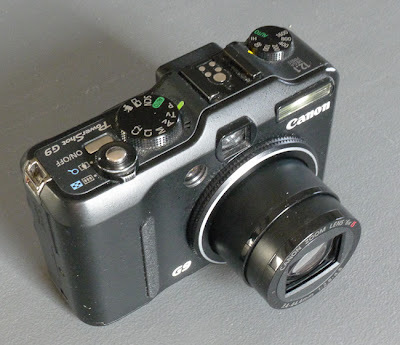 Arguably, the Coolpix 4500 (and earlier versions) had the best macro available in a non-dSLR camera. 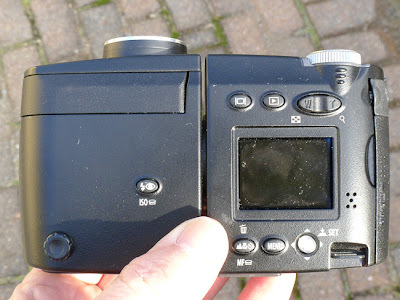 But the LCD was hard to see at only 1.8" in diagonal size, and the camera was mostly menu driven. The 4 megapixels made beautiful prints as large as 15" wide, and the files were certainly more than adequate for Web use. But I never found the user interface particularly user-friendly. I like lots of buttons to directly drive the controls, and the Coolpix 4500 had very few. It also lacked RAW capability and a histogram, both of which are now major priorities for me. My current camera of choice for Web photography is the 12mp Canon G9. The G9 is a discontinued model and is now two generations old; but, used ones are available on Ebay for around $200. It will shoot in an easy-to-use automatic mode (the green choice on the command dial on the top plate shown below), but also has a full complement of manual control buttons, dials and wheels. As good as the G9 is, for fly images that will end up as prints, a camera with a bigger sensor can do wonders. An example is the 16mp Panasonic GH2. In the picture below I have the GH2 equiped with 30-year old Nikon 55mm macro lens. The extra detail that comes from the bigger sensor (about 4x the squared dimension of either the G9) and a dedicated macro lens is not obvious when viewed on the Web and hardly noticeable even when viewed full size on a computer monitor (about 70-90 dots per inch), but when printed at 200-300 dots per inch the difference is spectacular. 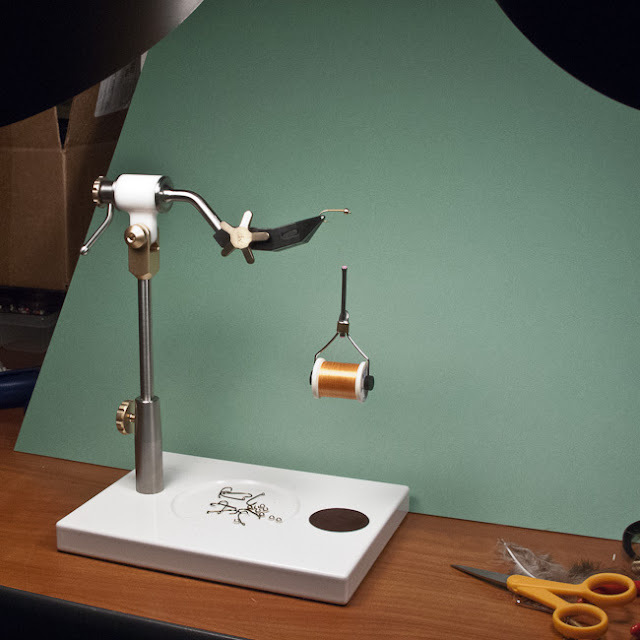 I was shocked to see that it was last May when I published a blog post about the One Feather Fly and promised to prepare step-by-step instructions for this simple fly. The months go by so quickly! 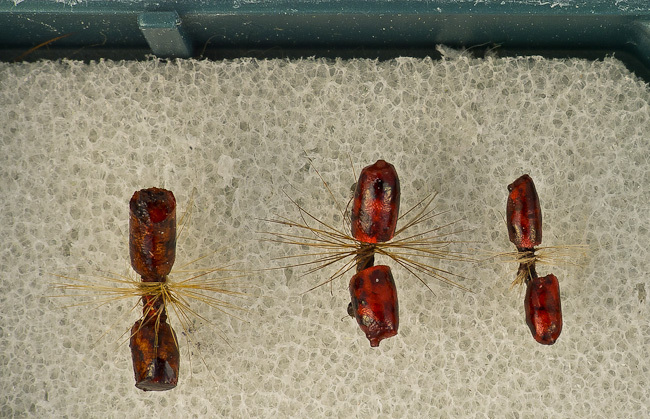 After that blog post, it was fun to receive a few emails from others who get a kick out of tying and using the simplest of flies. 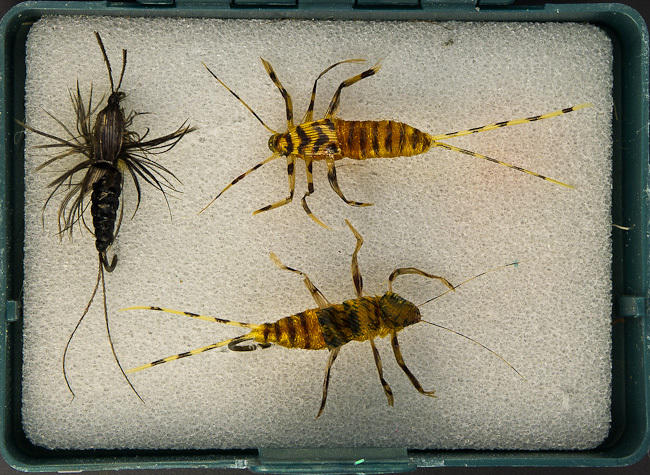 Now, in March, I find myself motivated to get tying and photographing because I am all out of these little delicacies! Unfortunately I find today that I only have two remaining 5/32" gold beadheads. I like to tie in groups of 10 or 12, and this is my favorite size when added to a TMC 3761 size 8 1xl wet fly hook. I'm sure the silver ones I have will work just as well; but they just don't look as good to me. I'll pick up some gold ones tomorrow at the Orvis Store. 10 size 8 TMC3761 hooks and 5/32" gold beads from the local Orvis store. 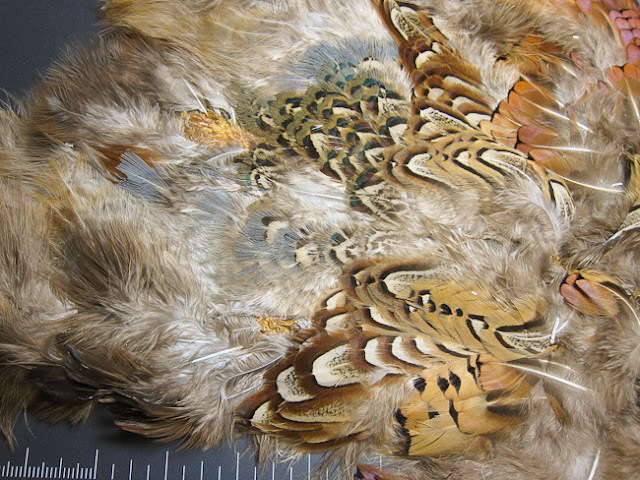 I'm going to need some nice rump feathers (one per fly) from my Ring Neck Pheasant skin. I'm sure I will find some decent feathers, but the skin has been pretty picked over. The closer the feather looks like blood marabou the better. Rump feathers are on the left (and this skin has been used a lot)! Back feathers are on the right. I found that the last set of step-by-step instructions that I prepared was about four years ago when I used it for the Conehead Combo. I like the template/format I used back then, and will use it for my upcoming step-by-step instructions. Unfortunately and unpredictably a few of the old pages on my Web site sometimes take more time to open in Internet Explorer than I like. I don't have any idea how they open in other browsers like Firefox or Safari. I am still using Microsoft's Frontpage 2003 for my Website and it is very old software. This blog is done through Blogger (which is Google) so the software behind the scenes is taken care of automatically and continuously by Google. The blog pages open nice and fast.